This exhibition celebrates the different productions of Verdi’s La traviata that have been seen at the Royal Opera House since 1946. The Royal Opera first performed La traviata in 1948 in a production by Tyrone Guthrie, designed by Sophie Fedorovitch. On display are elegant costumes from this production, including three worn by Elisabeth Schwarkopf as Marguerite (Violetta) and one worn by Joan Sutherland as Violetta, specially designed for her for the 1960 revival by Franco Zeffirelli. This production was replaced in 1967 by the famous Luciano Visconti ‘black and white’ production, and a selection of stunning costumes designed by Vera Marzot for Violetta, Flora and for members of the Chorus can be seen. The Visconti production was replaced in 1994 by the current production by Richard Eyre, designed by Bob Crowley, and Violetta’s costume from Act II, scene 2 has been borrowed from the ROH Production Wardrobe to bring the story up-to-date. Also in the exhibition are set designs by Nato Frascà and a portrait of Verdi by Deborah MacMillan, commissioned by The Friends of Covent Garden. 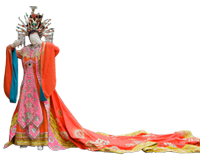 This exhibition was first seen at Christchurch Mansion, Ipswich, in 2009 as part of Royal Opera House On the Road.